If you are like me... then the 35% of your life that is spent NOT wearing work clothes, is spent wearing tee's and yoga pants. Granted sometimes I wear yoga pants to work... but that's besides the point, because I dress them up... wink, wink! Editors input: IF YOU CANNOT WAIT TO GET TO WHERE I TELL YOU ALL ABOUT HOW YOU SHOULD GO LOOK AT THE WEBSITE AND START SHOPPING, STOP LOOKING. I HAVE READ YOUR MIND... CLICK HERE! Two insanely talented t-shirt designers have come together to make all of that happen, and they even threw in a few koozies and sorority letters. If you are asking me... it's a one stop shop, and I would go back 100x, but again, that's just me. Q: How do you feel about bright colors and one of a kind designs that fill the college campus? A: If it sounds anything like... "YES! I love the best and brightest" or "OMG, does that shirt have an ombre font design"; because you were too busy looking at the picture above to read the question. Then yes, joining the Southern Crowd is for you. Q: Is having a set of shirts created for your next school function, wedding weekend or company softball game something that you're looking to do? A: If it sounds anything like... "Man, I have been looking for a company like this, ooooh maybe I should add a koozie to the cart while I am here... they are only $4.00". Then again, joining the Southern Crowd is for you. Q: Do you just love supporting your sorority, love buying tee's/tanks/accessories and koozies and have already filled your cart up? A: STOP READING! GO PAY FOR YOUR ITEMS AND GET EXCITED! This is for you and you are officially the best in the Southern Crowd. So go on over to Southern Crowd and take a look for yourself! Tell them Shelbi sent you! 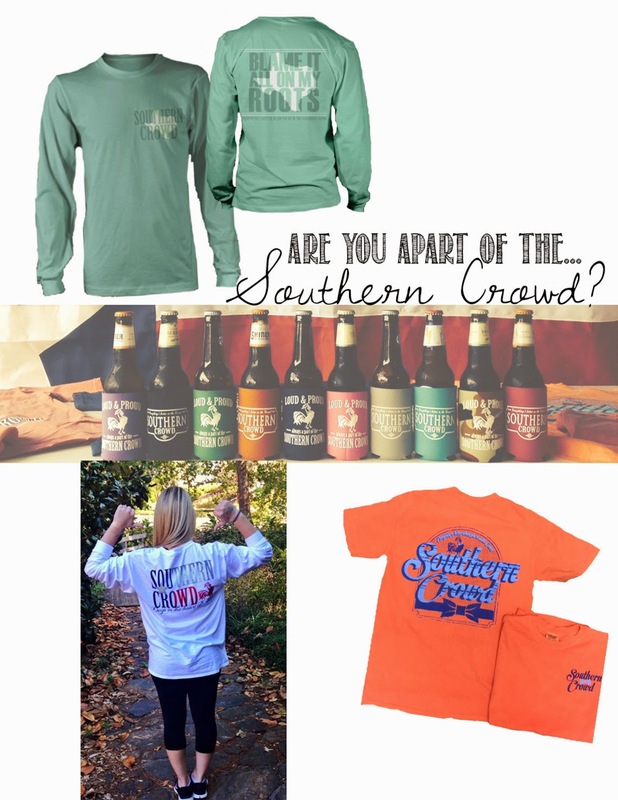 are you apart of the... SOUTHERN CROWD?